Where in Southeast Asia are political developments likely to affect sovereign credit trends? Local political developments have the most potential to shape sovereign rating trends in in Malaysia, the Philippines, and Thailand. For Malaysia, the risk is that the ongoing 1MDB saga could lead to an abrupt change in the government and unsettle investor and consumer confidence. The key question in the Philippines is whether political stability and economic policies will change under the incoming new administration. And, in Thailand, the main uncertainty is when political normalisation will happen to allow policymakers to focus on issues that affect the long-term growth potential of the economy. Do you see the weak external environment of recent years affecting sovereign credit quality in the region? Global economic uncertainty remains a risk, along with pressures on credit metrics from weaker commodity prices and the continuing deceleration in Chinese growth. Despite the weak external environment, major economies in Asean have performed relatively well and credit support for sovereigns in much of the region has remained broadly stable. Real GDP growth in 2015 fell from 2014 levels in some cases. However, most developing economies in the region had kept growth above 4.5%. And despite lower commodity prices affecting export receipts, most of the economies maintained current account surpluses. In Indonesia, where an external shortfall exists, the current account deficit shrank to 2.1% of GDP. Fiscal deficits in most cases either improved or deteriorated but remained at modest levels. Developments on these fronts have helped to maintain mostly stable outlooks on our sovereign ratings for Asean countries. Is credit quality deteriorating for the banking sector in Asean? Banks in Asean countries have had a bumpy ride so far in 2016. Asset quality has been deteriorating and loan growth has been reducing, largely due to a slowing regional economy and a decline in commodity prices. However, we expect most banking systems in the region to remain resilient to external macroeconomic headwinds. Their fair-to-satisfactory profitability and generally sound capitalization should mitigate any erosion in asset quality. The majority of the Asean banks we rate have stable outlooks, reflecting our expectations that these banks have built sufficient buffers over the years to absorb the difficulties. Many of these banks are systemically important and enjoy a high likelihood of government support. In our opinion, 2015 was the turning point in the credit cycle for most Asean banking systems, and nonperforming loans (NPLs) will continue to rise in 2016. Our base case, however, assumes a gradual deterioration, rather than a sharp spike in delinquencies. 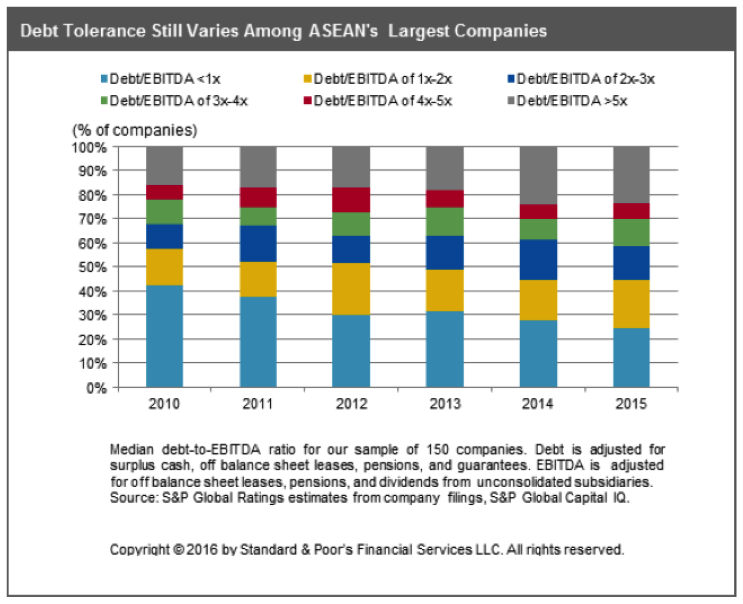 What are the major credit trends in the Asean corporate sector? Debt is still rising. However, debt accumulation appears to be slowing down after years of annual double-digit growth. In fact, gross reported debt for our sample of Asean’s 150 biggest companies declined to below US$300 billion in 2015, from about US$310 billion in 2014, using yearly exchange rates. That said, this decline is primarily due to a stronger U.S. dollar rather than a shift in financial management of Asean companies. We estimate that gross reported debt for the sample grew about 4% in 2015 to about US$340 billion using constant 2011 exchange rates. In addition, capital spending and dividend payments are, on aggregate, moderating. It is too early to tell if this is a structural trend toward more prudent financial undertakings or merely a pause in spending. But this trend is helping companies control leverage amid a tougher operating environment and a persistent decline in return on capital. Among other major trends, substantial differences remain in risk tolerance and balance sheet management among the largest companies in the region. 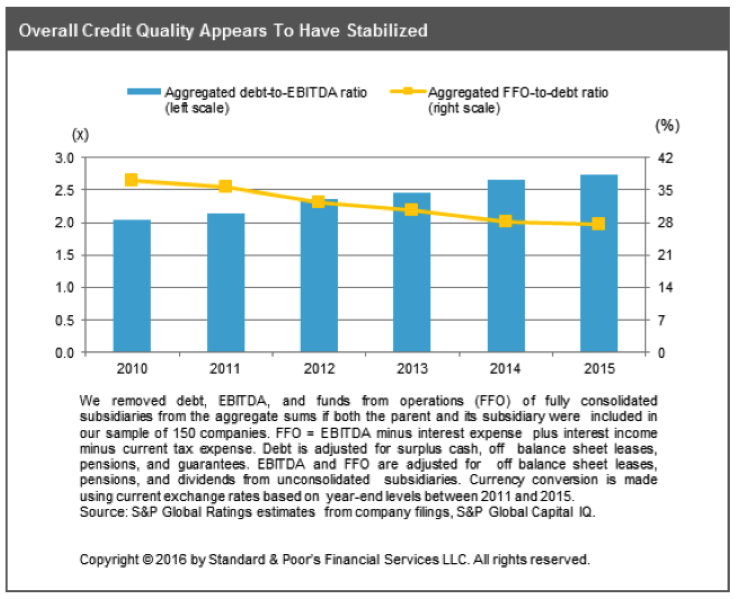 Does slowing debt growth mean credit quality has improved? Not yet. Debt accumulation was slower in 2015, but tough operating conditions in some sectors affected earnings and operating cash flows. Median revenue grew 2.5% in 2015 for the companies we reviewed, a further steep decline from about 6.5% in 2014 and more than 10% annually at the beginning of the decade. Margins also declined. As a result, the main indicators of credit quality that we look at--namely leverage, cash flow adequacy ratios, or interest servicing ratios--merely stabilized in 2015 instead of improving (see chart). Credit quality across the sample of 150 companies is still far from homogeneous. Balance sheets and financial policies remain polarized—a trend we have been observing since 2011. Close to a third of the companies we reviewed had debt-to-EBITDA ratios exceeding 4.0x, and a fourth had the ratio exceeding 5.0x, a level that we deem as an indication of high leverage. The proportion of companies with a capital structure that we view as very conservative—with debt-to-EBITDA below 1.0x—fell to a multi-year low of 25% in 2015. That compares with 28% in 2014 and more than 40% in 2010 (see chart 2). Here too, the erosion appears to be slowing down.